Olly Murs performing live on the 20th March, 2010 as part of the UK X Factor 2010 tour. Olly Murs is an English singer, songwriter. He is best known as being the Season 6 runner up on the reality show “The X Factor”. Olly was born in Essex, England. He has a twin brother named Ben who he as been estranged from since 2009. Olly was in a relationship with model Francesca Thomas from 2012 to fall of 2015. Olly performed at the 2011 Capital FM Jinglebell Ball. In 2012, he won the Nickelodeon Kids Choice Awards for Best British Male Artist. In 2013, Olly appeared on an episode of the television series “90210”. He has had several songs hit #1 on the UK Pop Charts including “Dance With Me Tonight” and “Please Don’t Let Me Go”. Olly Murs is a famous English singer-songwriter and musician, who was born on May 14, 1984. As a person born on this date, Olly Murs is listed in our database as the 3rd most popular celebrity for the day (May 14) and the 13th most popular for the year (1984). People born on May 14 fall under the Zodiac sign of Taurus, the Bull. 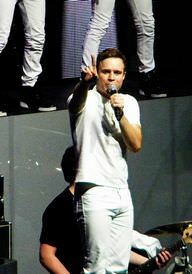 Olly Murs is the 58th most popular Taurus. Aside from information specific to Olly Murs' birthday, Olly Murs is the 61st most famous English. In general, Olly Murs ranks as the 690th most popular famous person, and the 75th most popular singer of all time. “The Famous Birthdays” catalogs over 25,000 famous people, everyone from actors to singers to scientists to serial killers and more. If you're curious to see who was born on your birthday, you can use our database to find out who, what, where, when and why. You can search by birthday, birthplace, claim to fame or any other information by typing in the search box, or simply browse our site by selecting the month, the day, the horoscope, or any other clickable option.